After breakthrough with SC250, we begin developing new generation solar powered wireless camera that will meet many industries requirements and challenges. See virtually anywhere (no power source available), any time, by adding the Solar Wireless (SC630) day & night camera to your property. Activated by a built in infrared motion detector, the SC630 is on guard whenever your system is armed, ready to capture color still images and video with sound in low light conditions - even in the dark. The SC630 can be used freestanding or secured to a wall, and transmit color video and sound up to 150 meters open area. 5.8GHz frequency to minimize interferance with other radio device such as cordless phone, microwave, wireless router, etc. With the wireless DVR system which make recording video image and play back later time as ease. Wireless DVR system won’t interfere with home “WiFi” networks. The SC700 come with 7" LCD screen, slightly larger than most on the market. Wireless DVR with video recording, auto start to record when motion is detected in auto mode. Motion detection & notification – alerts when motion is detected within a monitored area. 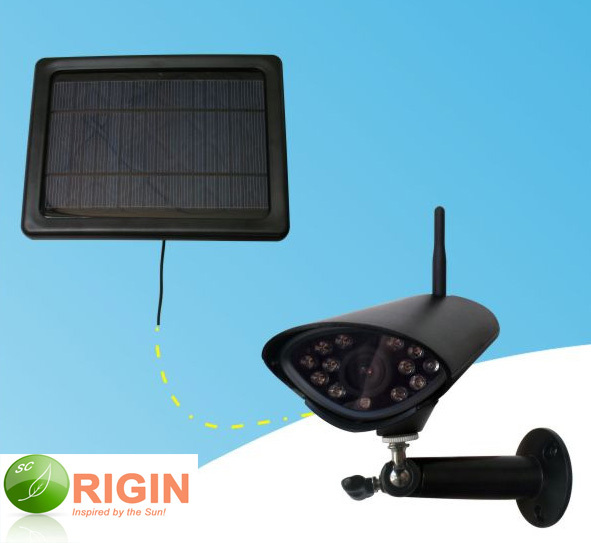 See virtually anywhere in your home or remote location (no power source available), any time, by adding the Solar Wireless Day & Night Camera to your home and property. Activated by a built in infrared motion detector, the Solar Wireless Day and Night Camera is on guard whenever your system is armed, ready to capture color still images and video with sound in low light conditions - even in the dark. At-home or factory users can view live video via a wireless 2.4" LCD Display and the LCD display can be mobiled anywhere you like. No fix location require for the wireless LCD display, it can be at the kitchen, bedroom or office. There are numerous wireless cameras on the market, but while they do transmit to receivers wirelessly, they still need to be plugged in to an electrical outlet for power. But the 5.8GHz Solar Color PIR Camera with a 2.4" LCD Display System is a truly wireless camera, receiving all of its required energy from the sun. With no wires to run, this camera installs easily, providing security and convenience in a simple, economical. This revolutionary new product runs solely on sunlight. No more worries about blackout and energy cost. 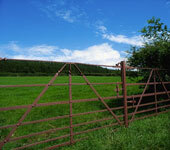 Prefect monitoring solution for remote area where by no access to power grid. It is widely used in remote operations. Wireless LCD Display system won’t interfere with home “WiFi” networks. The 2.5-inch LCD screen, slightly larger than most on the market. The camera can be used freestanding or secured to a wall, and transmit color video and sound up to 150 meters open area. The chic, low profile LCD display receives the signal from the wireless camera, and can be used on or off the charging stand. 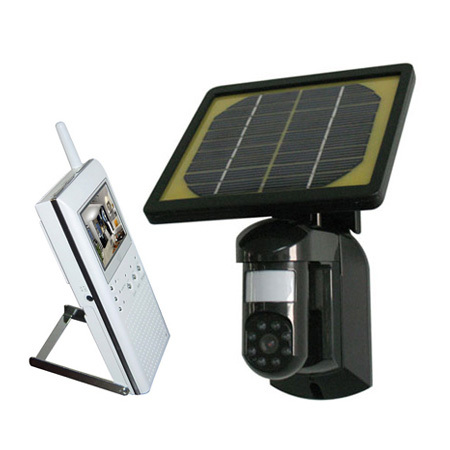 The Solar Wireless Camera can be switched on/off by pressing the ON/OFF button on the remote controller. While you are cooking in the kitchen or reading in the bedroom, you can place the wireless LCD display next to you and monitor your home and surounding.